To give opportunity to women to connect the world. 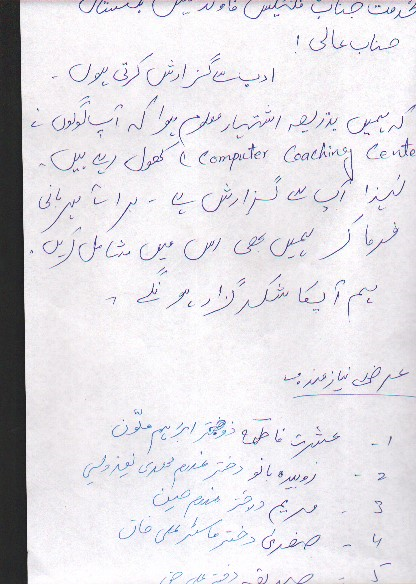 Several meeting conducted with the SCO In charge in Ganche and In Skardu about the possibility to give the connection in the Vocational Center. The Medical Officer of Machulo is a female Doctor. She needs Internet for to study more. When she joint in Machulo and I had a meeting with here. She request me to Give permission to come in the Guest house every evening .She need the Internet So as a guest and a worker of Hushe valley I allow her to Come in the Guest house and gave her a Cabin to work.In the other hand we were planning to install the net in VTC.It was little bit long for her to come every day evening time in the Guest house for a Lahore Girl and late night go back to her house also was an issue. We discuss some time about general things. In the meantime I said her that oh Dr Nagis if we install the Net in the VTC ? Can you give A free lesson on Computer for some girls? She say that it will be a good idea. She accepts this Idea and I share you as well. Now there are some girls Applied to have this training. An advertisement put in the street and on Face Book Page. Now I have purchased the Cables and other necessary items From the SCO. It is arrived in Machulo and the cable laded to VTC. Soon the Girls will start this training. This will be very easy access to the doctor to get Internet from VTC .The girls can learn basic Computer and many things from the Doctor. Felix Foundation can give a free training to the girls. So three Main goals FFB can achieve from this activity.